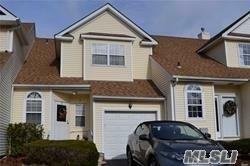 Lovely 3 Bedroom, 2.5 Bath Townhouse. Located Near All Shopping. All Amenties. Community Pool, Clubhouse, Tennis Courts, Etc. Eat In Kitchen With Sliders To Large Deck. Large Full Basement. Security Gaited Community 24 Hrs !!!!!! 24 Hrs. Notice Needed !!!! !